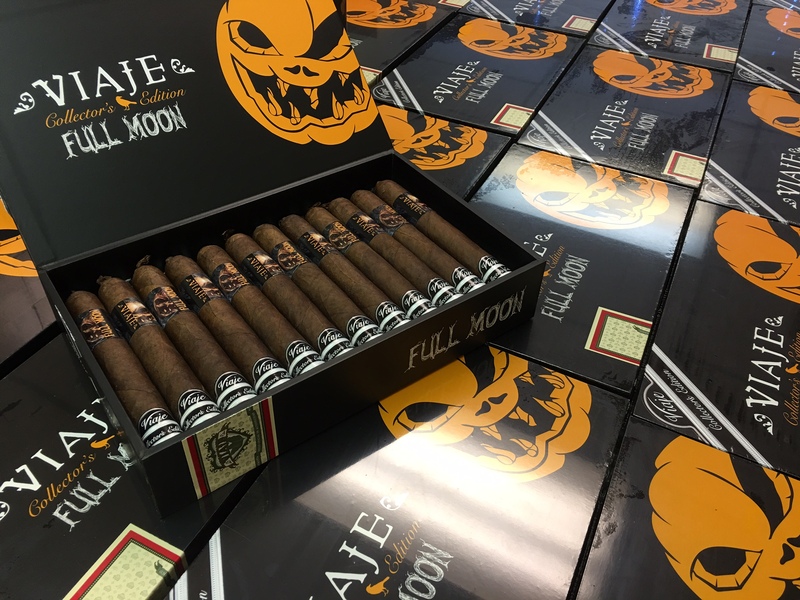 For the fourth year in a row, Viaje Cigars will be releasing its Viaje Full Moon seasonal release for Halloween. For this year’s release, the cigar becomes the latest installment in Viaje’s Collector’s Edition series. According to Viaje, the cigar and the packaging have been changed. The Viaje Full Moon Collector’s Edition will be a 6 x 56 Toro size. It will also feature an oversized pig-tail cap and a have an unfinished footer. The round boxes have been replaced by 24 count rectangular boxes. The Collector’s Edition series was introduced in 2012 and provides a special cigar size for those who like to “collect” Viaje cigars. The Collector’s Edition releases have been “one and done” – meaning once the cigars are gone, they are gone. In 2012, the Viaje Oro Collector’s Edition became the first installment. The following year the Viaje Exclusivo Double Edged Sword II Collector’s Edition was released. Last year, Ten Viaje Skull and Bones Ten Ton Tess Silver and Viaje Skull and Bones Ten Ton Tess Gold became the third and fourth releases respectively. The Viaje Full Moon 2016 now is the fifth installment. The Viaje Full Moon was introduced in 2013. The cigar was a 5 x 58 Nicaraguan puro. The Full Moon returned in 2014 and 2015. Last year, there was also a very limited second Full Moon cigar known the Viaje Full Moon Edicion Limitada. This cigar would feature a maduro wrapper (as opposed to a natural wrapper) in the 5 x 58 format and was only shipped to five retailers. I know a place that has original ’13 cigar if anyone is interested. “Firth” is between fourth and fifth, right?